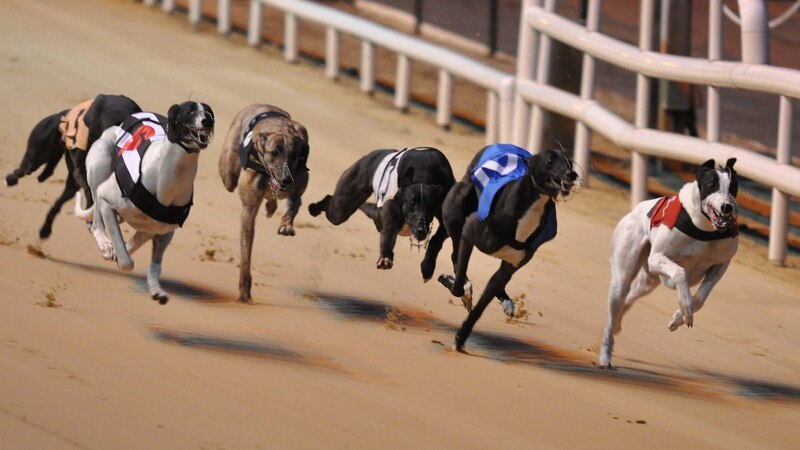 Greyhound Racing Grass Roots : Glamour Paws kick-off Derby Rd Two! Glamour Paws kick-off Derby Rd Two! Speaking with the Glamour Paws Syndicate last October after Me Phat Daddy claimed victory in the Track Supporters/Langton Hotel Derby at Kilkenny, we learned of a syndicate of friends who had enjoyed wonderful success since Aileen & Kathleen Lennon introduced their fellow members to greyhound ownership. Now contesting the 2017 Boylesports Irish Greyhound Derby, Me Phat Daddy ran with great credit despite a hefty bump to qualify from Round One and racing from Trap 1 in Heat 1 for tonight's second round, kicks-off proceedings at Shelbourne Park while carrying the Derby dreams of his enthusiastic owners who are pictured below, just in advance of his Round One appearance last weekend. 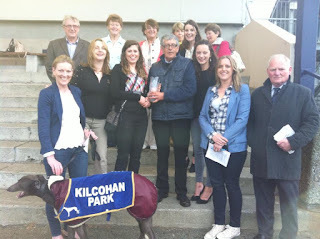 One of the most prestigious graded stakes on the entire calendar, the A1 525 Yard Langton Hotel & Track Supporters Club Derby at Kilkenny Greyhound Stadium, more often than not, requires any aspiring winner to possess talents beyond that A1 level and in 2016 the event returned a most impressive victory for Me Phat Daddy (Scolari Me Daddy/Lemon Soul) who extends the brilliant ownership exploits of the Glamour Paws Syndicate in Kilkenny. Joining the AA0 ranks having claimed the €4,700 first prize, he delivered on his early career promise by winning three of his four heats in the competition. Recording a career best 28.79(-30) in Round 1, he completed the event with a most accomplished display from his suitable Trap 1 draw when keeping pace with 2015 Tipperary Cup winner Black Tom to the opening bend before asserting his dominance on the back-straight for a strong running five and a half length verdict. A third racing representative for his winning owners who began their syndicate with none other than Scolari Me Daddy in 2009, Me Phat Daddy will now target the Waterford Masters with syndicate member Aileen Lennon, daughter of trainer and prolific breeder Dinny Lennon in Threecastles, hopeful that he can continue to improve. “He’s running great, we’re delighted with him. He’s just starting to come into his own now actually. He gave a long time where he wasn’t really right in himself, just not eating well even though there didn’t appear to be much wrong. But he came through that, was back eating and Dad said to me back in June or July, he’s right now! From that day to this, he has just kept improving, long may it last! The Glamour Paws Syndicate has been hugely successful and although Scolari Me Daddy’s career was interrupted with injury, the eight glamorous ladies who make up the syndicate enjoyed a wonderful start with a Derby quarter finalist who was one of the fastest of his generation. A second runner followed who was naturally always going to be a son of the now successful sire and Me Daddy Rocks was another smart sort, reaching A1 while bridging the gap to the arrival of Me Phat Daddy. The syndicate ownership experience is one that Aileen, thoroughly enjoys and along with her family, truly believes that it has a very important part to play in the promotion of the sport. “We had a great start in fairness and not everyone is going have a dog as good as Scolari Me Daddy who will end up at stud. I would like to think though, and I do believe, that even if the first dog had turned out to be less than average, we would have kept the syndicate going. 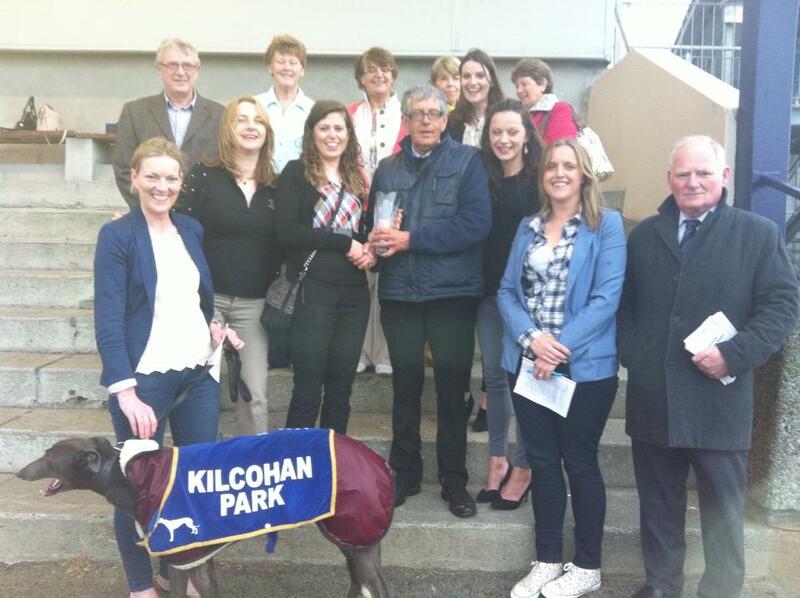 “With us, it was myself and my sister Kathleen that started the syndicate and we were lucky to have dad doing his best to get us a good one, which in fairness he always does for a syndicate because he wants them have a good experience and promote the sport. But our other six girls have had a great experience and really gotten into the whole thing. “I don’t think people realise enough just how easy it is to do it. We just started off with €100 each and put €30 a month into it after that. When you think of the cost of entertainment these days, it’s for nothing! All you want after that is someone to take control of things and Aine Costello does that for us thankfully, she’s great. Poor auld Dinny would never get paid if it was left to the rest of us! “I know we’ve been lucky but we’ve never had to put any extra into the pot, even with Me Daddy Rocks who wasn’t as good as the other two. Making money out of the syndicate wasn’t the priority but we’ve been lucky and we are in profit, especially with the few bob coming from Scolari Me Daddy’s matings who I must thank all the Dunphy Family for. They have been great to deal with, we couldn’t praise them enough. 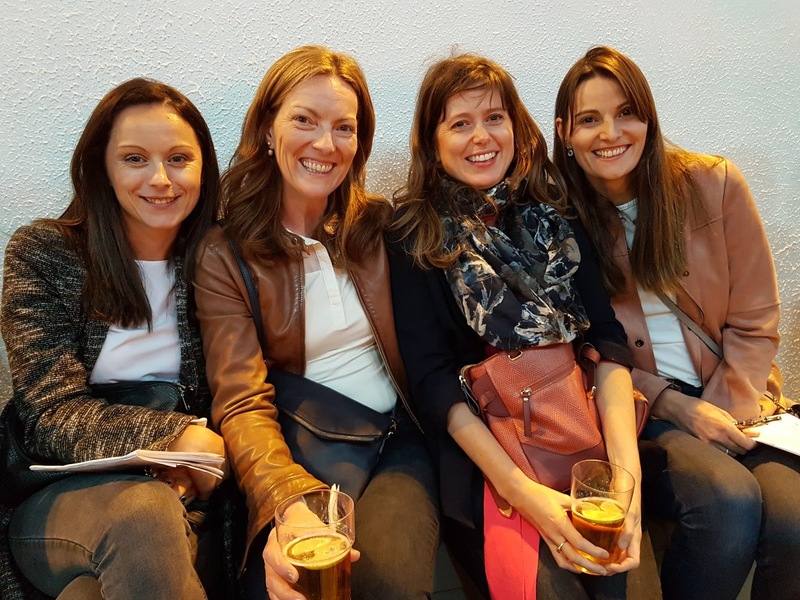 The previously unmentioned syndicate members are Catriona Drennan, Katie Norton who is a lone Tipperary woman amongst seven Kilkenny cats, Lorraine Norton and Aisling Maher. Asked about the naming of their dogs and of the syndicate Aileen exclaims, “Oh Karen is the glamorous one, the rest of us just follow but we have done some agonising over the naming of the dogs. We were taking ages to come up with a name for Me Phat Daddy but the forms had to be sent away and my brother Tom, doing a bit of messing with us, named him Sugar Lollipop and sent it away! The ownership history of the Glamour Paws Syndicate is a wonderfully successful story and they have shown that for minimal investment and admittedly with a touch of good fortune, syndicate ownership can be a fruitful and exciting way to be involved in greyhound ownership and we wish them all the very best of luck as Me Phat Daddy prepares for the Waterford Masters and beyond. 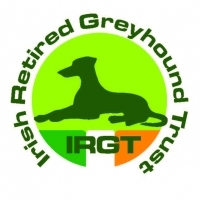 If you wish to learn more about greyhound ownership or the formation of your own syndicate, you will find all the help and information you need on http://www.igb.ie/ownership/ where you can download our ownership brochure, syndication registration forms or read about more successful syndicates and their own individual approaches to owning a racing greyhound. Also don’t be shy in asking the many friendly greyhound folk you will encounter at your local track, you will find that are all only too happy to welcome new owners to the sport and help in every way they can.